I love these cooler fall days that we have been having! Yes, even the rainy ones, because they are perfect for working around the house (or being lazy and reading a book). But the sunny days are marvelous, and I try to get the kids outside as much as possible to soak up the sun before the cold winter days hit us. 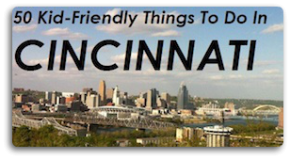 One of the best FREE things to do around town is to go to the park, and there are so many great ones to choose from in Cincinnati & Northern Kentucky! 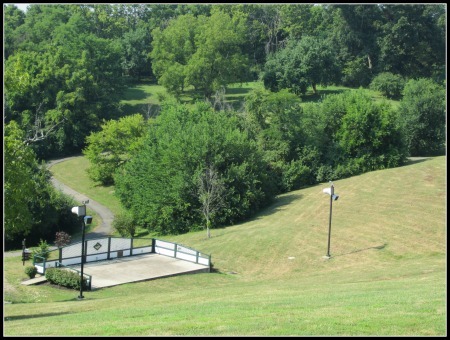 One park that we really enjoy is Pride Park in Taylor Mill. The park is quite large and very pretty. There are several fun playgrounds for the kids to enjoy, and I love it because they have equipment for all ages & sizes. It’s hard to take my toddler “on the go” to the park because he always wants to climb as high as he can, much to his mother’s chagrin. So I love when we go to a park that has stuff his size that I can steer him towards. When we go to Pride Park the kids bounce from play area to play area while Mama sits in the shade and watches them go. My favorite thing to do at Pride Park is to walk the trails. They are paved trails, that are a mile and a half long, and they are a great way to exercise because it’s a path that wanders up and down hills. And the scenery is so beautiful, you are surrounded by woods and hills. The kids always enjoy our walks on these trails as well. That’s not all Pride Park has to offer though..they have an amphitheater where they host movie nights, an 18 hole Frisbee Golf Course, shelters that are available to rent, and a basketball court. So there’s something for everyone! For directions & more details about special events at the park check out the Pride Park website!